This easy creamy vegan broccoli soup recipe is so good, no one will know it’s vegan! Before I divulge the recipe for creamy vegan broccoli soup, let’s take a moment to talk nuts. You may have heard that nuts are bad for you because they are high in fats. A study published in April of 2018 in the International Journal of Epidemiology found that contrary to popular belief, nuts and seeds can lower your cardiovascular risk. In fact, the study showed that people who consumed large amounts of protein from nuts and seeds experienced a 40-percent reduction in cardio vascular disease. Those who depended mostly on animal protein sources had a 60-percent increase in cardiovascular disease. In other words, if you want to reduce your risk of cardiovascular disease, you might want to incorporate more nuts into your diet and learn to depend less on animal-based protein sources. This recipe for creamy vegan broccoli soup will help you. It helps if you have a high-speed blender (such as a Blendtec or Vitamix), but you don’t have to have one. 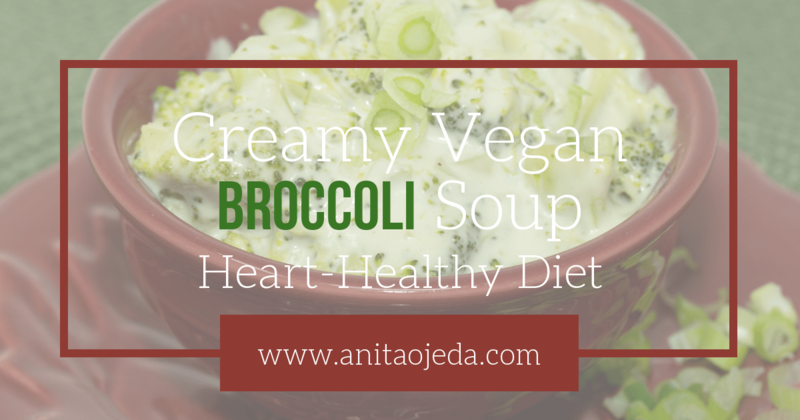 Try this easy creamy vegan broccoli soup recipe! It combines the heart-healthy benefits of vegetables with protein from nuts–a win-win combination. In a medium-sized saucepan, heat the olive oil on medium-low while you chop the onions, garlic, and broccoli. Sauté the onions and garlic until they are limp, and then add the chopped broccoli and 1/2 cup of water. Stir well and cover. Stir every three minutes while you prepare the soup base. In a high-speed blender, add the first four ingredients. If you have a Blendtec, select the ‘Soup’ button and walk away. Otherwise, blend on high for 5-6 minutes. Once the broccoli is tender, pour the soup base on top. Use another cup of water to rinse out the blender jar and add to the soup. Bring the soup to a simmer over medium-low heat, stirring occasionally (about 5 minutes). Let me know if you try it! If you have any vegetarian, gluten-free, or vegan friends, now you’ll know what to make for them :). I am going to pass this recipe onto my daughter-in-law who is vegan and tries to cook tasty foods for her carnivore husband (my son). Yeeeeeessssss. This looks so good! I’m always on the lookout for simple weeknight recipes, and my husband loves broccoli! We’ll be trying this one out for sure! I’ve never put cashews in soup before, so I’m looking forward to trying this recipe.